This heavy duty stapler is designed to handle your most demanding stapling jobs. You can trust Bostitch products to provide a life time of precision performance. 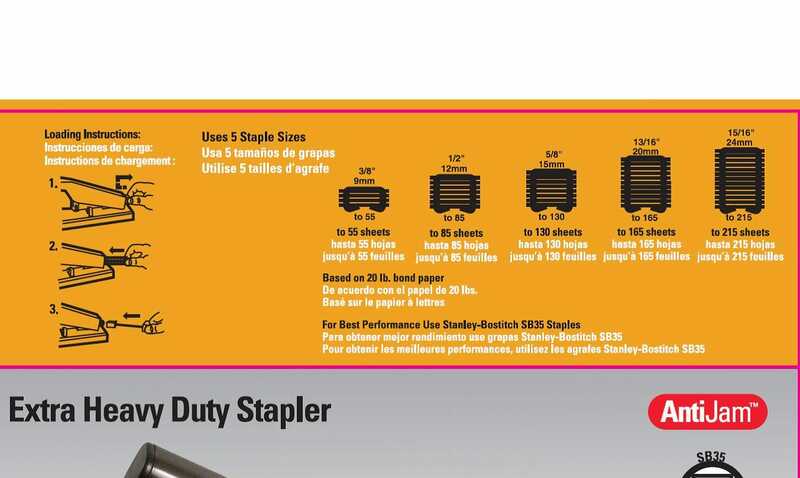 The 00540 Extra Heavy Duty Stapler can handle 215 page documents with surprising ease. It is ideal for busy offices, libraries, classrooms and more. A 200 sheet stapler is a special thing indeed! Each unit features innovative No-Jam™ technology to end frustrating, document damaging staple jams. Each heavy duty stapler features an all metal construction provides consistent for a life time of use. Additionally, each item is Antimicrobial protected, ideal for busy office settings. The adjustable paper stop allows custom and consistent staple placement for a professional appearance. And when you have a lot of documents to staple, you will love the rubber feet designed to keep the heavy duty stapler in place. Be part of the legend, get the 00540 and turn your heaviest stapling projects into easy projects. This stapler uses 1/4” – 15/16” SB35 Series Premium Heavy Duty Staples. There is a staple stuck somewhere inside the staple area. I can't open the machine to remove the blockage. I can't push something through to remove the blockage, as there is no access from the front. Wonderful stapler! I staple through large paper stacks all the time. This stapler staples solidly and reliably time and time again. Highly recommended!